Sum-mer. 2 syllables and you stress both. The summer is synonymous with good weather, outdoor activities, holidays and free time to enjoy nature from sunup till sundown. That’s why you must welcome the summer solstice and we recommend doing so from the highest point in Spain: Mount Teide, whilst you enjoy the marvellous view of the sunset from one of the Cable Car viewpoints. 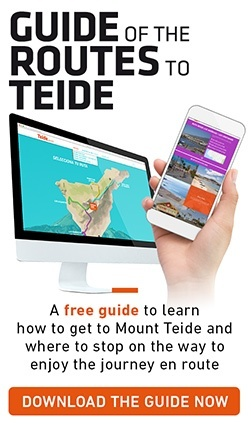 Do you know how spectacular the views are from the top of Mount Teide? If the weather allows, you’ll see the spectacular views of south Tenerife from the viewpoint of Pico Viejo, with its singular crater that’s 800 m wide at your feet. You’ll spot the islands of La Palma, La Gomera and El Hierro while you toast to an epic summer with a glass of Canarian sparkling wine at sunset, an incredible sunset on the longest day of the year. The summer solstice is the longest day of the year. It’s a very special day and so this activity is also just as special. During the summer solstice on Mount Teide you’ll learn more about our King of the sky, the Sun, and about the summer solstice with a very interesting talk by our astronomical guides, during a key moment of the summer solstice, just before the sunset, and in a place more than magical, on the spectacular viewpoint of Pico Viejo, with views of south Tenerife. And to finish enjoying the longest day of the year, we leave professional telescopes at your disposal so that you can welcome summer observing the Sun up close. On the 21st June you’ll take the Cable Car before the sunset to see how the Sun places itself at the most northern point possible, creating the longest day and the shortest night of the year. You’ll observe the Sun from a privileged position: the viewpoint of Pico Viejo, with its sublime views of south Tenerife and some of the neighbouring islands, with a glass of Canarian sparkling wine in hand to toast an unbeatable summer knowing a little more about the Sun and this magical day of the year. This activity to celebrate the summer solstice on Mount Teide includes optional transport with pick-ups from Santa Cruz and La Laguna whose service is subject to there being a minimum of 10 people. The meeting point to enjoy the summer solstice on Mt. Teide is at the Cable Car station at 6.45pm. The meeting point in Santa Cruz is at the Intercambiador transport interchange, to the side of the main entrance at 5.00pm. Wear comfortable, warm clothing and proper footwear. People with health problems should consult with their doctors before undertaking this trip. Children under 8, pregnant women and people with heart problems are not allowed to participate in this activity due to the risk that high altitude poses to their health. This activity includes a 40-minute walk both ways of medium-low difficulty, therefore you must be in good physical shape. You may cancel free of charge up to 4pm on the day prior to the activity day. Any changes or cancellations made after 4pm on the day prior to the activity day or on the same day of the activity will be charged a cancellation charge of €30.00. If the Cable Car cannot operate due to adverse weather conditions, the sunset shall be enjoyed from the Chío viewpoint or similar, and we will give you a refund of the price of the cable car return ticket at the following rates: €27.00 to non-residents and €13.50 to residents. The Teide Cable Car base station has a free car park with 220 parking spaces. The car park is open from 8.00am to 6.00pm. Titsa bus (guagua), Route 348 Puerto de La Cruz – Las Cañadas del Teide. Departure times: 9.15am from Puerto de la Cruz, with stops in La Orotava, Montaña Blanca (trail to the Altavista Mountain Refuge) and Teide Cable Car, and return from the Teide Cable Car departing at 4.00pm.